As told by Yegor Zhgun. It all began with a letter from Ludwig Bystronovsky. Way back when I just joined the Moscow metro map project, he’d sent me a joke from the Internet with a metro 2100 map by Alexander Chekmaryov. Ludwig’s comment read “that will keep you busy for many years ahead, Yegor.” We both laughed at it and forgot it completely. Some time later, under the impression that the “regular” metro map was just about to be completed and announced (we were only wrong by six months or so), I opened Illustrator and transferred all the lines I could decipher from the old scheme sent by Ludwig to the current map, marking them as “under construction.” Some areas remain unclear to me to this day: for instance, try to figure out what is going on around Park Pobedy station. Firstly, this exercise of adding lines proved to be a good endurance test for the “regular” map showing its ability to accommodate the constant expansion of the subway system. And secondly, the resulting image was a good candidate for the final picture on the project’s announcement page (have you noticed, most of the final illustrations on our announcement pages have some twist?). While searching the web for the original 2100 metro map, I’ve come across another similar work by evgen-i, depicting the subject in 2050. Sadovaya line from 2050 version really caught my eye. It has a strong logic behind it. For instance, imagine, Kalininskaya line is finished all the way to Smolenskikh station, and all three stations are connected by the Great Passage of the Fate. Suppose, at some point you could really walk through direct tunnel from Polyanka on the gray line to Yakimanka on the orange. In this case, the only free-standing stations without walking connections within the circle line would be Mayakovskaya, Tsvetnoy Bulvar (keep Trubnaya in mind), Sukharevskaya, and Krasnye Vorota. Now it would be the most sensible thing to run a line through all four. Arbatskaya station is a different story (see below). In short, I added the Sadovaya line together with a couple of others into my layout and have sent the image to Ludwig and Tema Lebedev. Each responded in his own way. Ludwig informed me that he actually lives by Beskudnikovo and testifies that there is only one such thing, definitely not two. That was accompanied by a request to never, EVER send him such pictures again. Tema wrote to display all “under construction” lines as completed and throw a black background under the whole thing for a f***ing good poster. First thing I did was to go see the studio’s main specialist on Moscow metro—Sasha Popov (Russos)—asking him for links and images with the metro construction plans for the nearest century. 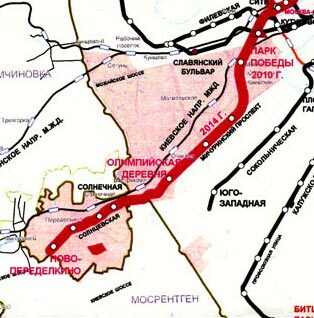 Russos had a good laugh at the future line between Alexandrovsky Sad and Kremlyovskaya stations as that would require nothing less than running a tunnel directly under the Moscow Kremlin. He confessed that guys in Metrostroy (Moscow subway construction organization) have a hard time picturing the map in 20, leave alone 100 years. Take, for instance, the last station on Arbatsko-Pokrovskaya line called Kalininsky Tupik, it naturally makes you think that the Kalininskaya line will at some point extend all the way there and embrace this station. Yet some people say the line will branch out in the direction of Solntsevo area, but no one knows for certain. It’s hard to argue with Russos. 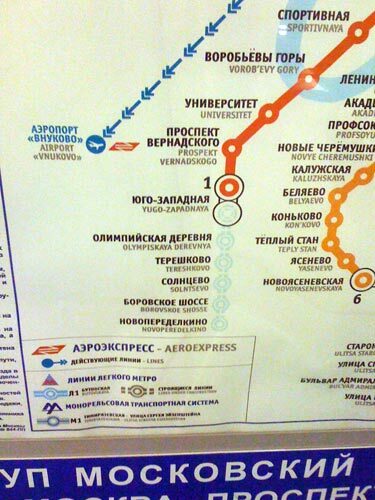 For example, the official metro map presented at every station by the cashiers still carries some mysterious Solntsevskaya line under construction with a connection on Yugo-Zapadnaya station. Maps placed inside train cars do not have the said line anymore. It was eliminated to make room for the legend in the bottom left corner. To make matters worse, if you follow the official metro website address found on both types of maps—by the cashiers and inside cars—Solntsevskay line appears again, only this time with a connection on Park Pobedy station. In the first case it’s a part of the Medium-capacity rail transportation project, so popular in the nineties, which folks from Mosgorreklama simply forgot to remove. The second case belongs to the classic subway. It’s also clear that Kakhovskaya line is a fragment of some future linking system. And so feels the connection between Cherkizovskaya and Ul. Podbelskogo stations, where the red line takes a sudden sharp, 90 degree turn to the left. Suppose, they are parts of the new Big Circle. Balchug island will host Kadashevskaya station one day. I’m sure I’m not alone puzzling over absence of any Pokrovskaya station on Arbatsko-Pokrovskaya line, while Arbatskaya station is fully present. There used to be a plan to build Pokrovskie Vorota and Khmelnitskaya stations between Ploshchad Revolutsii and Kurskaya, but later on it was trashed for the sake of the construction speed. Spartak stadium should be finally built one day, which will bring back to life the frozen station between Shchukinskaya and Tushinskaya. Three stations—Park Pobedy, Petrovsko-Razumovskaya, and Vystavochnaya—are already equipped with second platforms, anticipating arrival of new line. 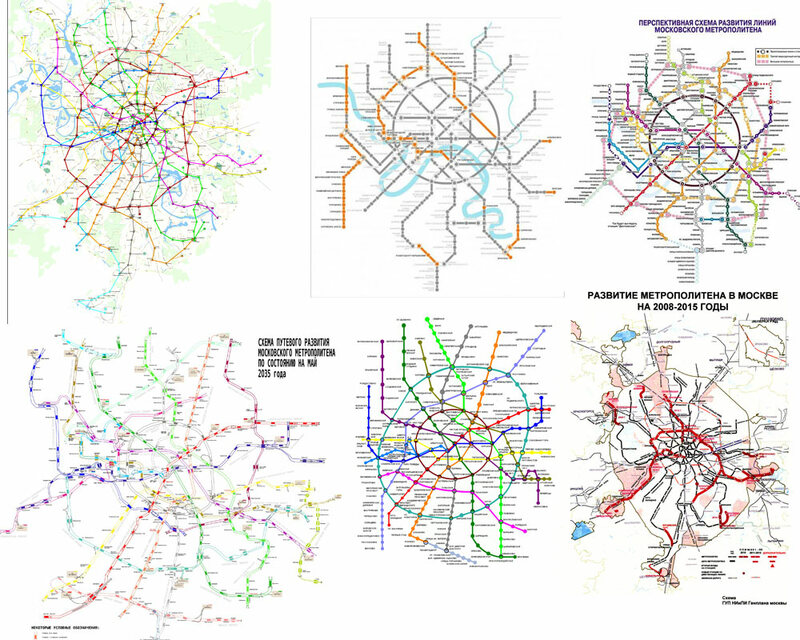 In short, some future of the Moscow metro expansion can be guessed pretty accurately today, as for the rest, Russos has issued me a carte blanche. Ok, then let’s study the general plans and search the internet to see what others think on this subject. After seeing all these other pictures I did not cease to like the Main Circle chords crossing at Maryina Roshcha, so it was decided to keep the base structure that was already drawn. It’s silly to expect anyone in the twenty first century to call a new station Serp i Molot (Hammer & Sickle), even though there’s a railroad station with such name nearby. But I made an exclusion for this case together with my other favorite—Sharikopodshipnikovskaya (Ball Bearing)—the both stay on metro 2100 map. Giving some color to lines, stations and connections. This process revealed Google limiting the amount of drawn objects on each map. So, you have to use layers to make it work: when something you’ve just drawn is not showing up, create a new map and instruct Google to display it together with the previous one. I have two such layers here. At the end, it will take me three and a half to display all of the projected stations. Placing the whole thing against the black background and figuring the way for circle lines and rivers. Moscow circle road, railroads, and airports. The joke with airports brings to mind JFK and Heathrow. For example, let there be direct train from Khimki and Lobnya to Sheremetevo (hello, JFK), and a metro line to Vnukovo (hello, Heathrow). The subway line at the end chosen to run to Vnukovo airport was Sokolnicheskaya. There was a plan for a third hello—this time to Tokio airports—by addition of extensive system of trains merged with the subway running to Domodedovo airport. But the current version of the map does not host any city trains (look forward to the future editions). White circles make Lebedev dizzy, so we paint all connections black. Time for cross-platform connections, inherited from the detailed version of the “regular” map. Still trying to somewhat color-code sections of railroads without disturbing the main picture much. At some point it becomes clearly a bad idea, since it’ll cause a complete rework on all the lines inside the major circle for the map version that includes trains of south-west to north direction. The whole project was executed under Lebedev’s motto “the more stuffing, the better. Let their eyes go crazy looking at this map.” Express tram map from the north section of Zamoskvoretskaya line and Rublyovka highway came to my attention. So, we included it in our map as well. The South and the West lines were acquired from the great project metrofuture.livejournal.com. Adding Bykovo and Ostafievo airports. Later on we’ve decided to ditch the West line, just did not work out. Then we found the Official Chart of the Express Tram Development. Another idea for a new version of the map. As a side effect a wall on the fifth floor in our studio got decorated. Somewhere around this time the “regular” metro map was finally completed and announced on our website. As was planned before, the metro map 2100 became that last funny picture on the page. A couple of people showed interest in buying that image as a poster, so the new poster was finally made. Adding the finishing touch, so absolutely essential for Moscow 2090—the Skolkovo district. Getting the poster through prepress and off it goes to the printers.